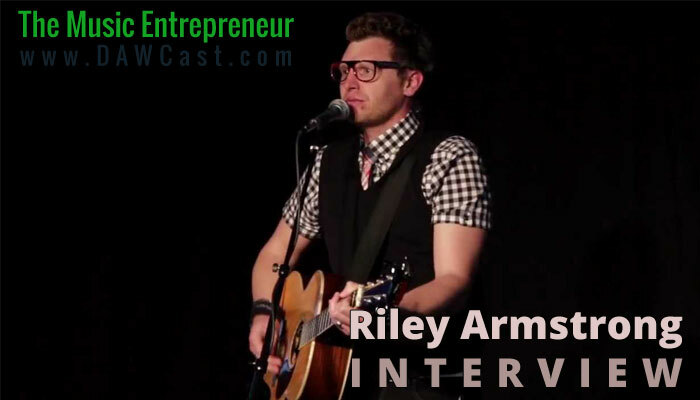 On April 29, an uncharacteristically brisk spring day, singer/songwriter Riley Armstrong was gracious enough to take some time out of his busy schedule to sit down and have a chat. We met in a local coffee shop, and after we were seated in a corner near the door, we immediately began talking about the types of drinks we usually order at coffee shops, and everything to do with music. Soon enough the subject turned to recent happenings in Riley’s musical career, and his upcoming album La Loop, and I felt it an opportune moment to begin the interview with this down-to-Earth Albertan. On your website, it says that you listen to Radiohead. What are some other bands you listen to, and what are some of your musical influences? Back in the day, one of my biggest musical influences was Ben Harper, and I’ve always liked Ani DiFranco, and of course Lenny Kravitz – he’s been a huge influence. You would never even hear it in my music, but I just really enjoy his earlier stuff. Not so much now. What I’m listening to right now would be Snow Patrol, and Keane, and more indie rock that I’ve been into lately. How would you say your music has changed over the years? I’d like to think that it’s gotten better. As you grow in your songwriting, it’s like a muscle, right? The more you work out, the stronger you get. I think the same can be true about songwriting. The harder you work at it, the better you get at it. I would hope that this coming record would be the strongest so far. I think it’s more cohesive, and sticks together better. The thoughts are better developed. I think that that would be some of the ways that the music’s gotten better – there may be a bit more sensibility. On your website your music is described as a mix of acoustic guitar with hip-hop rhythms. Do you think that’s a description that still holds true? Yeah, it’s funny cause it’s still a big part of what I do. You know, vinyl beats, and vinyl loop records, and beat box stuff. But at the same time you’ve still got that folk guitar element that’s the common denominator from track to track. The lyrics in your music are often quirky and clever. What inspires you to write your songs? Just about everything. You know, I’ll be inspired by… There’s been songs that have come about from movies… watching movies. Songs that have come about from situations that have happened. I got married last year, and that was a big resource for feelings and emotions, and that’s often what songwriting is for me – it’s an outlet for thoughts and feelings on the inside. What’s the deal with “Recipe” off of Whatever the Weather? That was just one of those things that I threw in there to see if I could throw people for a loop. It’s one of these tracks that’s really good the first couple times, and after that, it’s like “man, that’s annoying.” I should’ve kept it as a hidden track or something. But it was fun, just something different, for people to expect the unexpected when it comes to my music. I hear you have a new album coming out very soon. What can we expect? The new album is going to be called La Loop (affiliate link), which is based on the verse from Ecclesiastes the first chapter, that talks about how there’s nothing new under the sun. Just as the sun goes up in the morning, and it will go down in the evening, the next day it will be the same, and Solomon was talking about this great wisdom he had, that he has discovered, that there’s this symmetry – God has ultimate control and sovereignty in this world. So, I’m going to learn the same lessons that my dad probably learned. There’s this cycle in life, that’s beautiful, just as in the hard times that I’ve had in my life, I know that my kid maybe or others out there will have the same hard time, and it will come around, and their joy can come of it. God uses those cycles to life to build us – our character. That’s what makes life such an adventure, it never stays the same, it’s always changing, and that’s kind of the idea behind La Loop. You’ve been an “acoustic-only” guitar player for a long time. More recently, I’ve seen pictures and videos of you playing an electric guitar. That’s right, I’ve been branching out with my Gibson 135. I love that thing. It took awhile to figure that thing out, cause I play my acoustic so hard that my fingers start bleeding. I just really play it hard. But when you’ve got an electric guitar, you play that hard, the strings just fall off the saddle on the bridge. In the middle of a song, it’s like [makes string falling off of bridge noise]. So I really had to learn how to play softer on electric, which is such a weird idea, but make sense when you sit back [and think about it]. It’s like, of course. It’s electric. It’s amplified. You don’t need to kill it. What motivated you to pick up the electric guitar, and is this a permanent change? No, [it’s not a permanent change]. We were doing these youth rallies with a group from Missouri called Real Encounter. They were basically this group [that did] freestyle motocross and extreme sports [and that] was their platform that they reach people with. We went into public schools and got kids to come on out to our event, and acoustic just… it needed something more – [more] grit to it. So that’s when we started using electric, [it] was primarily for that. Then I just stuck with it for quite awhile after that and thought, “you know, this kind of works.” Since then, the band I’ve been playing with – there’s two people that I’ve been playing with – they don’t play with me all the time, just for bigger occasions. So I’ll pull out the electric when I’m with them, but for the most part I just play acoustic again for this new record. Do you consider yourself a guitar player first, or a musician first? I would say that I’m a songwriter that knows just enough chords on the guitar to write songs. I can’t shred to save my life. That’s why I dig on the Kurt Cobain one-note solos [makes guitar solo noises]. I’ve seen you perform live about 5 times. Sometimes you were with a band, sometimes you had a drummer, and sometimes it was just you and Conrad [Conrad is Riley’s all-in-one vinyl loop beat box sampling machine]. Do you have a more permanent band lineup now? No, it’s pretty much going to be back to Conrad and Riley on this new record. I recall on the “Pretend it’s a Movie” tour you played a 80s medley. Do you still play it on tour sometimes? No, I haven’t done that so much anymore. I think that I’m going to have to come up with a 90s medley, you know, a little Milli Vanilli. Some Milli Vanilli and L.L. Cool J or something like that for the 90s medley. What is it like to be on tour? It’s hard work. It’s “go, go, go” with lots of late, late nights and not a whole lot of sleep. It definitely keeps you on your toes. But the beautiful thing about being on tour is, with the events close together, it gives you something to work at. Like when you’re doing one-off shows, like I’ve been doing in the last few weeks, it’s fly in for the weekend, fly in, fly out, fly in, fly out. Where this is more of a concerted effort where you’re on your way in, and you get down to work, and you kind of get to have a little bit of a routine, even though it’s crazy sleepless routine. But there’s still a little bit of routine, and it’s kind of fun. And ultimately when you’re on your own tour you get a chance to play for people and make them laugh, and that’s the reason I do this – to offer [a chance] for people to discover the songs that I’ve written, and to like them, and to take them home with them, and make them happy. On your own tour that’s in essence what you’re doing – you’re out there playing for people and giving people something to smile about. Have you learned any big lessons from touring? That could be a whole another side to this tape. I’ve learned some huge, huge lessons about treating people with respect; and logistics, and how to plan accordingly. The variables in touring are time and gas, and there’s only so many hours in a day. I’ve also learned a lot about pacing yourself, to try not to spread yourself too thin cause that can be something you do when you’re “go, go, go.” [I’ve also learned] where you can get wireless Internet, and learning tricks to flying, and different little ins and outs to know how to park the van and trailer so it doesn’t get stolen. Calamity [Riley’s previous touring van that was stolen and trashed]? Yeah, exactly – I’ve learned a lot of hard lessons like that. What was it like when you first started playing shows? What kind of venues did you play in? When I first started, I was pretty terrible. What primarily held people’s attention was the humor aspect of what I do. As I’ve grown, the humor’s still been there, but I’ve gotten better at playing which has been good. 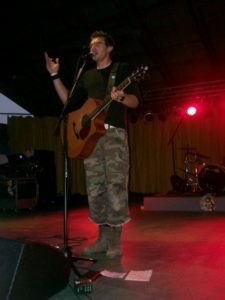 Initially the venues I played were primarily churches, or youth groups, or coffee shops. Since then I’ve moved onto youth rallies and youth conferences and summer festivals. So we do a lot more bigger stuff now. But every once and awhile, we still do little things too, especially on campuses of universities or colleges. At the time, did you have any trouble finding your next gig? Oh, you better believe it. Since then we’ve discovered MapQuest and figured out the inner workings of MapQuest and that sure has helped, because there’s been times I’ve come pretty close to missing an event. Do you have any secrets or tips as far as booking shows is concerned? First of all, you have to believe in what you’re booking. Second of all, you have to create something that people will want to hear. You want to create something that makes it unique, something that makes it different from something else. It’s not like selling a used car, you know, it’s a lot like selling an opportunity for people to experience what you have on your plate. And that’s not easy. It’s really not. Booking is really a tricky business. Over the years, a good thing to do is always if you have a show or event that goes well, that will hopefully lead into other ones that go well. You know, it’s amazing how it bubbles up and one big thing leads to another, and that’s been my experience. I’ve had big booking agencies in the past, and I’ve had moderate to low success in those. I’ve found that the best way to do it is just to have that personal touch, and I think people really like that personal touch. Rather than, “Hi, my name is John Smith from massive huge booking agency wanting to book you an event.” At first a lot of people that are having you in, that scares them to death. It used to be when people would book Riley for a show they would get close to 18 pages of rider that they would have to sign on and send back. And most people that get that would be like, “uh, maybe this wasn’t such a good idea.” It scares them away. Now we just have a simple one-page agreement with just a few items. It just keeps it more accessible. It’s not our prerogative to create some sort of paper mess. All we want to do is play music and share it with people. So, whatever it takes to make that as simple as possible. So that’s what I’ve learned about it in the past, make it simple, believe in it, and make it accessible. Do you have any advice for young struggling bands that are trying to get themselves established? I wouldn’t even put struggling in there, I would just say young, because I think we all struggle, no matter where we are. If it’s not one thing it’s the other. I think that as a young band, the best thing you can do is just practice and truly start to understand what you are doing and what you are about, and to really define yourself. I think one of the greatest steps that a young band takes is to truly define themselves. Start out small, and don’t start with too high of expectations. Set attainable goals, and don’t be too focused on trying to get a record deal. A record deal is not the be-all end-all. And any shows you play, try to make them your best shows so people are interested in booking you. There’s always something that could go wrong, but just do your best. And I think the internet is a great resource for bands, and has kind of made music a level playing field for bands that are getting started. Do you think there is a point when a band or artist is “good enough” to perform, or should they push themselves to perform in front of an audience as much as possible? That’s kind of a tough question. I think one should tread lightly. Playing shows will help you grow, and kind of show you where your weak points are and the holes in the band, and what you need to work on in order to grow. As much as possible, you should be well-rehearsed before playing a show. What is your goal as a musician? Do you consider your music a ministry? Yes, music is a ministry to me, because the joy of the Lord is a big part of why I do it. What are your thoughts concerning the “Christian music scene?” Is it reaching the right audience? Do you think it’s relevant to non-believers? Well I’ve heard the expression “singing to the choir,” which may not be far from the truth. I don’t think it’s as effective as it could be, but I think it does a good job of offering alternative listening. There are elements that certainly make it viable, but has it arrived? No. I think there are a lot of bands out there like Switchfoot that offer the goods that the market will like. So all in all, I think that it’s getting better. I also like to think of worship music and Christian music as two separate things, and I think that Christian music can be relevant, and it’s different because Christian songs aren’t corporate songs, whereas worship songs oftentimes are.